Microsoft’s fall press event in New York City is almost upon us, and that means there are plenty of rumored Windows 10 hardware and software updates to be excited about. The company announced the event in a blog post on the Windows Experience site earlier this month, with very few details aside from the place, date, and time. The event is scheduled to take place Wednesday, October 26, 2016 at 10 am ET, and we’ll be covering the event live as it happens. If you’re not one of the handful of journalists invited, however, there’s still hope to catch all the breaking news. Microsoft will be livestreaming the event right here. Details are scarce about what Microsoft is actually revealing. Still, we think we know at least a few line items the company will touch on. With that in mind, here’s what you can expect from Microsoft’s upcoming press event on October 26. Microsoft is reportedly working on a brand new Surface PC, but this time around, it’s getting rid of the wonky kickstand and keyboard case. The newest version will be a an all-in-one desktop rather than a touchscreen laptop. Rumors of an Surface desktop have been floating around for years, but now it looks like it will finally become a reality. This particular rumor got serious earlier this month when images of a Surface-branded keyboard leaked through an FCC filing. In addition to images of physical devices, Windows Central published what appears to be a Microsoft promotional page of the same keyboard and mouse, which also happens to have the same coloring as other Surface devices. Finally, a patent filing from August suggests that Microsoft is at least looking into the idea of a modular desktop PC that uses several components that snap into place. This is certainly the least substantial rumor, especially because patents like this only occasionally turn into real world products (so we’re not holding our breath waiting for this one). One important thing to mention is that Microsoft will make security a major talking point at the conference if it in fact launches a new keyboard. In July, cybersecurity company Bastille published research showing how millions of wireless keyboard were vulnerable to a security threat, many of which were Microsoft keyboards. The flaw allowed hackers to log keystrokes. Now, security experts expect Microsoft to roll out a new AES encrypted keyboard to go alone with the Surface desktop. Update 10/25/16: A report from Trademark Ninja claims that a Microsoft shell company in Slovenia recently trademarked Surface Laptop and Paint 3D. The company has also trademarked the terms Surface Studio, Surface Dial and Dial. Most experts believe that Surface Studio will be the name given to the all-in-one Surface PC. We’re expecting a majority of the event to be about the future of Windows 10 across all products. Part of the discussion will revolve around the new devices Microsoft’s partners are building for the platform, but there’s also some interesting stuff happening on the software side. Microsoft is planning to ship two major software updates next year, according to the company’s own Windows for IT Pros blog post. The updates are codenamed Redstone 2 and Redstone 3, and we expect Microsoft to describe the release roadmap in detail. As you may already know, Windows Anniversary Update (codenamed Redstone 1) rolled out back in August. The update brought some serious changes to the operating system including updates to Cortana, the artificially intelligent assistant, and Windows Ink, the workspace specifically dedicated to styluses. The next few updates will include more improvements to existing Windows 10 features. 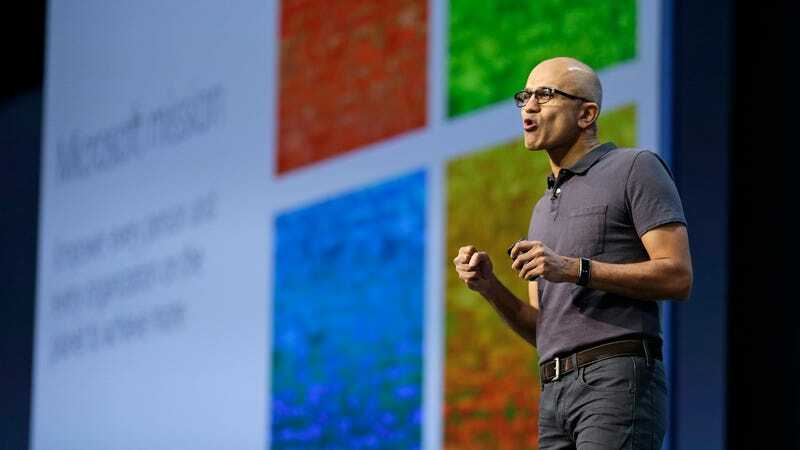 ZDNet reports Microsoft is already rolling out a Redstone 2 test build that includes improvements to Windows Ink, camera app, and Linux subsystem. Now, Windows Ink will include shortcuts for drawing including Stencils and a protractor tool. This will hopefully make it easier for people using Surface tablets to draw or design. The camera update is mostly small tweaks including higher-contrast capture buttons, a new photo-timer from the camera dashboard, a new zoom slider, and the option of accessing your photo roll with one hand rather than two. These are all welcome changes that should make Windows 10 feel like a more complete operating system. It’s unlikely that Microsoft will announce a brand new Surface Book laptop or a brand new Surface Pro tablet—but we could see upgrades to existing models. If either the tablet or laptop make an appearance at the event, it will likely be to announce new Kaby Lake processor upgrades to both products. For the uninitiated, Kaby Lake is the name of Intel’s 7th generation Core i3, i5, and i7 processors. The new group of processors is supposed to reduce heat, increased graphics performance, and faster CPU clock speeds. Whether or not that’s enough to boost sales or increase user demand remains to be seen. Windows Central is reporting we’ll most likely see brand new Surface Pro and Surface Book hardware in Spring 2017. The rumor is that the speaker would work similarly to the Amazon Echo or Google Home, meaning it would answer questions, set reminders, and run basic tasks on connected household appliances. The device would reportedly also connect with Windows 10 computers in your home, meaning you could access media files like music or files, and have them streamed to other devices around the house. If true—this could be one of the best smart speakers yet. This one is happening for sure (because it’s basically already started), so it’s unclear whether Microsoft executives will spend much time talking about it at the event. It would be really surprising if they skipped over it mainly because it’s actually a pretty awesome update. Microsoft is working with developers to bring some of the most popular Win32 games to the Windows Store as part of its Project Centennial bridging tools, which makes it easier for Windows 10 to run win32.exe binaries. In more basic terms, this means we could see a return popular Windows games ever including things Age of the Empires or anything that ran on older versions of Windows. Generally speaking, there will probably be some major programs added to the Windows Store to coincide with the launch of Microsoft’s all-in-one Surface desktop. In addition to both discoveries, in June, designer Christian Jolicoeur tweeted an image of Windows 10 settings has an entire subcategory for a wheel under devices that are typically paired to a PC like a mouse or keyboard. The description of the app says, “Use the wheel with your left hand and the pen with your right hand.” Jolicoeur speculates that the device will be similar to Wacom’s Express Key Remote, which has customizable buttons and a dial that lets you create shorts in applications like Adobe Photoshop. In short, if you put together all of the clues that are available, the Surface Dial, it will likely be a handheld device that designers can use to create shortcuts and streamline their creative process. It’s still unclear how much Microsoft will charge for its radial controller, but we’d expect it to be about the same as the Wacom Express Key Remote ($100). Microsoft confirmed earlier this month there will not be a new Band fitness tracker released this year (or probably ever). Similarly, there will not be any new Microsoft phones this year. There has been a rumor for years that Microsoft will eventually release its own mobile handset to compete with the iPhone, known on rumor blogs as the “Surface Phone,” but all signs show that the Surface Phone probably won’t make its debut at this particular event. ZDNet’s Mary Jo Foley, who is a seasoned reporter and regularly breaks scoops on Windows products, reports the Surface Phone probably won’t materialize until late 2017 or maybe not even until 2018.